Star Tours Fans don't have to be at Disney World to get the latest Star Tours stuff. Disney has an on-line Star Tours Destination for fans to check out when they can't get to Florida. Amongst the latest additions to the site is a new Star Tours Poster that you can print out and an exclusive Disney.com Vinylmation Star Wars™ iron-on. Disney.com’s Star Tours online destination will be releasing exclusive Star Tours printables for fans to download. Stormtroopers and Jedis alike can now visit the Star Tours destination page to download and print a Star Tours poster to hang inside their Starspeeder 1000s. 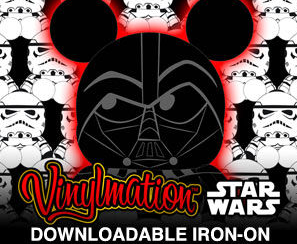 Fans can also access an exclusive Disney.com Vinylmation Star Wars™ iron-on to help spruce up their intergalactic wardrobe and accessories. Next week, Disney.com will release Star Tours coloring pages to help entertain the young padawans in the family. The site also features exclusive videos, character bios, descriptions of the Star Tours planet destinations and behind-the-scenes footage from the attraction at Disneyland and the Walt Disney World Resort. Fans can check out even more exclusive Star Tours crafts, printables and recipes from DisneyFamily.com. 0 comments to "Visit Star Tours On-Line At Disney.com"